Very good. There are possibly some strakes that could have some fastenings tightened. 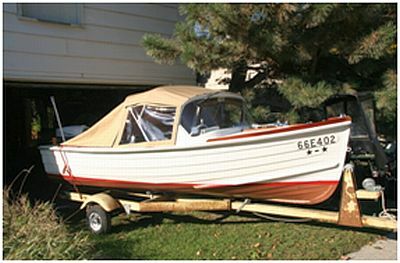 This versatile boat was constructed at a boat building class in Michigan in 1958. It is in very good condtion. 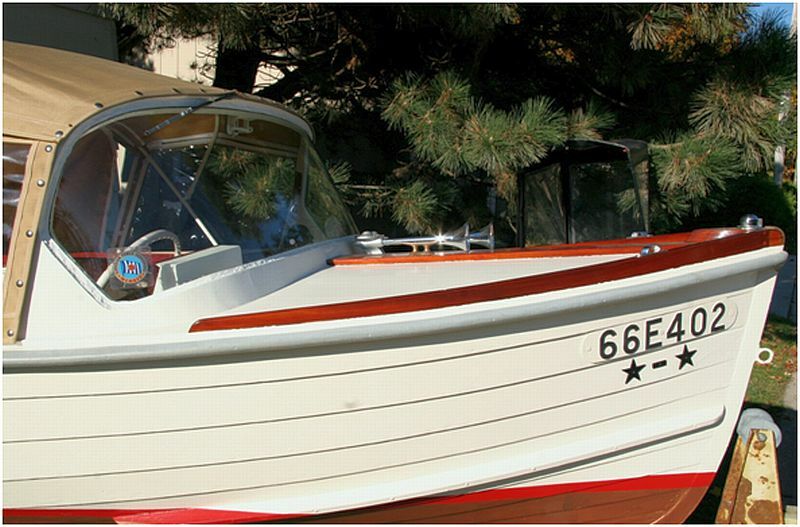 As with all wooden boats, it takes a few days for it to take up. There are possibly some strakes that could have some fastenings tightened. Four sections of new canvas cover the seating area. The side panels at each side of the front seat have clear panels. The aft end of top panel is attached to the metal frame, and can be rolled up on the aft section. The front and back seats have a new full width cushion. A hand operated windshield wiper is located on the starboard side of the windshield. A small rear view mirror is located in the center of the windshield. 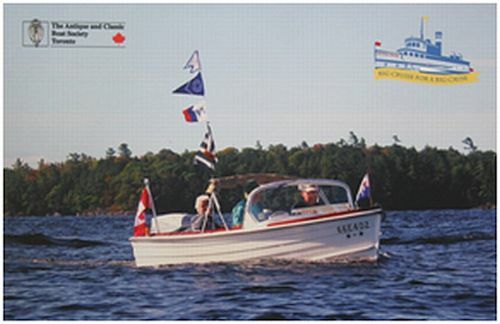 A hand operated air horn is located on the port side of the foredeck. 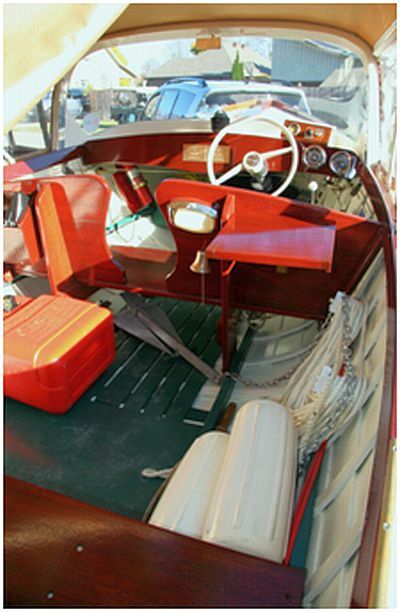 The steering wheel and the single lever gearshift are located on the starboard side at the front seat. A compass is located in the center of the boat and the instrument panel is to starboard. 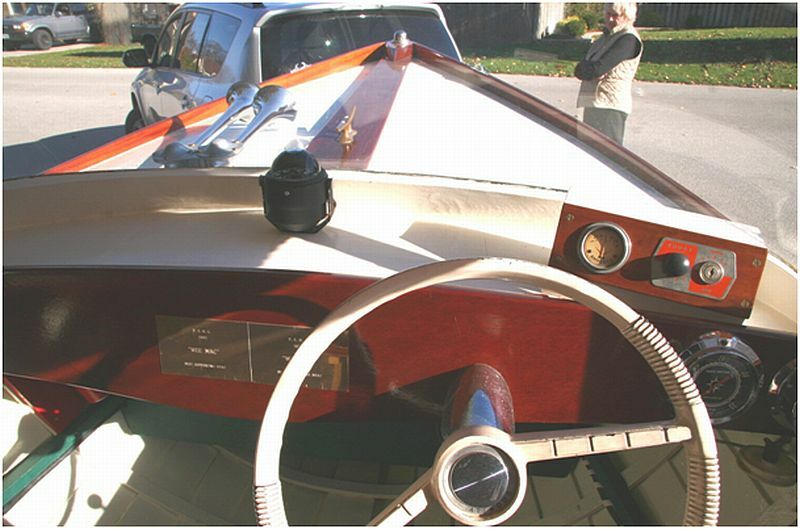 A speedometer and clock are located outboard of the steering wheel. 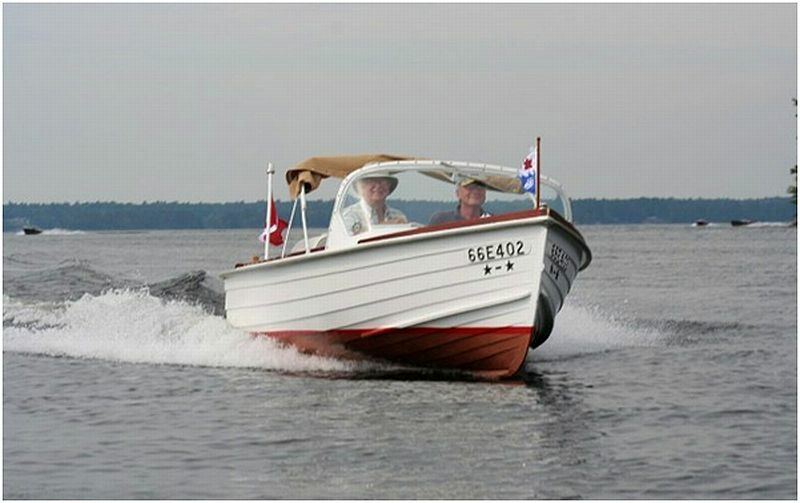 A storage box is located on the back of the forward seat on the port side, and a light fixture, a small bell, and a small fold down table is on the back of the forward seat on the starboard side. 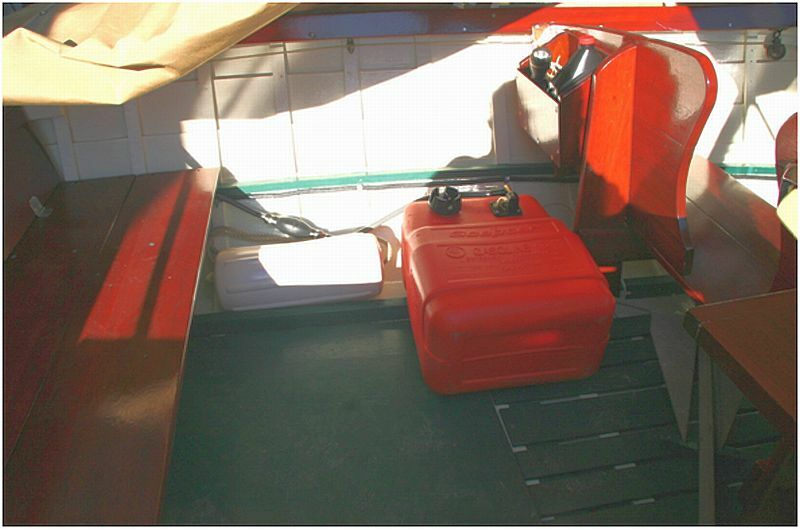 A portable fuel tank is located behind the front seat on the port side. A Danforth anchor is secured underneath the forward seat with 5’ of chain and approximately 100’ of line, coiled on the starboard side of the hull. Four large fenders are stored under the aft deck, along with deck lines. A portion of the back of the aft seat back folds down to provide access to the power switch and aft compartment, where the battery is located. A combination red and green running light is located at the forward end of the foredeck, and a white light on a pole is located on the starboard side of the aft deck. Each have a switch. A fire extinguisher is located under the foredeck on the port side. 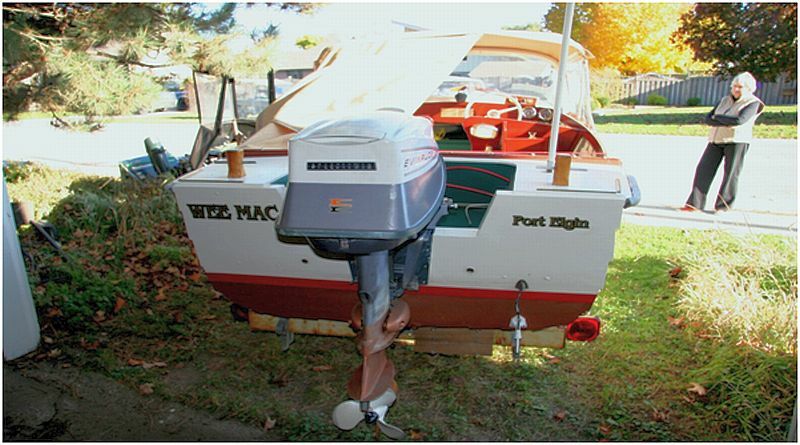 A hand bilge pump with a hose extension is located on a shelf under the foredeck. 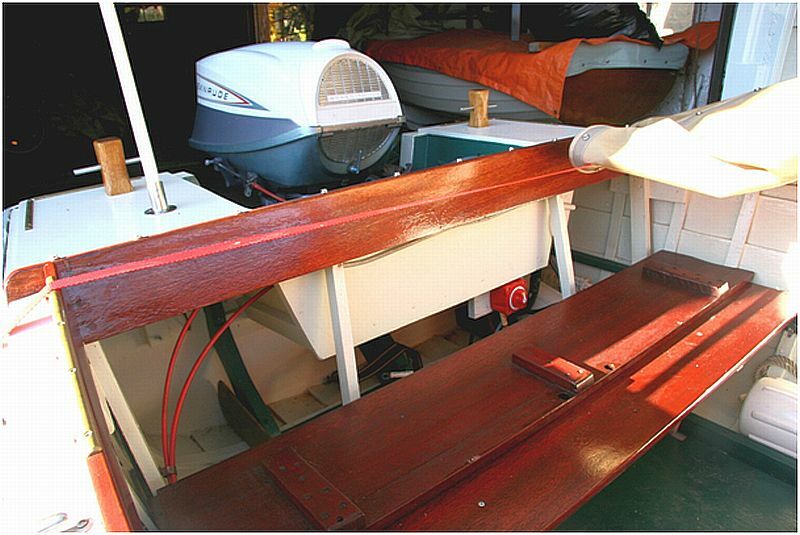 A rubber fending strip extends completely around the boat attached to the rub strake. The windshield is the back window of a 1957 Ford car. Four adult life jackets, and one child life jacket.